This elegant daybed will add a sophisticated touch to your spare bedroom. 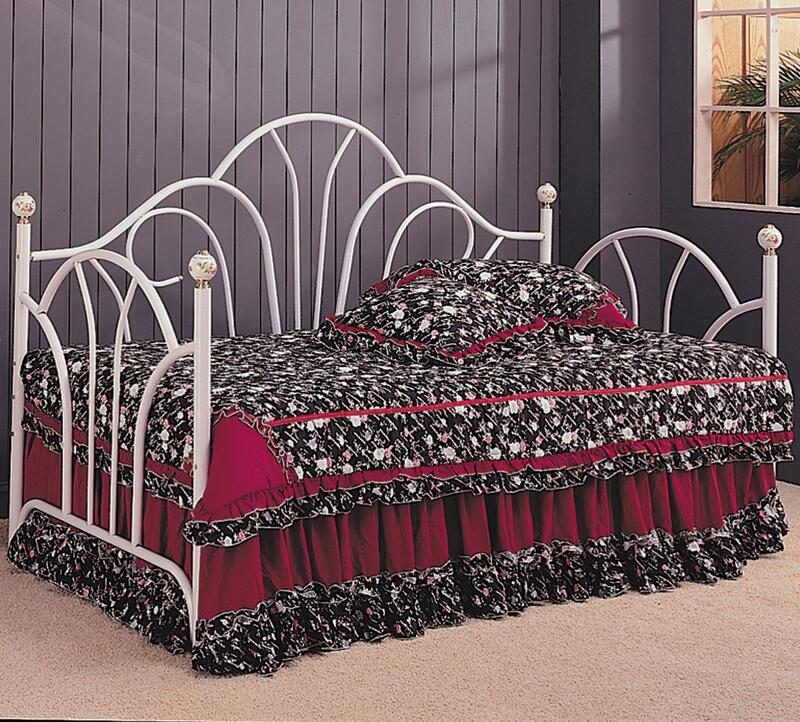 The clean White metal bed features a curved headboard and footboard, with a beautiful fan back for a bit of drama. Painted porcelain knobs are decorated with a delicate floral, giving this daybed a distinguished look. This piece has great functionality, offering a nice place to lounge and read by day, and a cozy spot to sleep at night. Add this beautiful daybed to your home for a quick style update. This daybed includes a required link spring. Mattress not included. The Daybeds by Coaster Traditional Twin Daybed with Metal Fan Back by Coaster at A1 Furniture & Mattress in the Madison, WI area. Product availability may vary. Contact us for the most current availability on this product. 1138A Link Spring 1 0" 0" 0"
2632 Traditional Twin Daybed with Metal Fan Back 1 79" 39" 47.75"
This group of daybeds offers you great function and style, perfect for the spare bedroom in your home. With a variety of different styles and finishes available, these daybeds will freshen up your home. Offering a comfortable place to relax during the day, and a cozy spot to sleep at night, a daybed is just what you need to complete your youth or spare bedroom. Great style and value make these daybeds a wonderful choice for your home. The Daybeds by Coaster collection is a great option if you are looking for furniture in the Madison, WI area. Browse other items in the Daybeds by Coaster collection from A1 Furniture & Mattress in the Madison, WI area.